You are here: Home / Decor / Havana Nights auction theme: Tacky or trendy? Since 2014 when President Obama re-established relations with Cuba, the country has been a popular topic in my client meetings. And with the recent death of Fidel Castro, news about Cuba has been widely covered in the papers and on television. For this post, let’s discuss Cuba through the lens of our focus on fundraising auctions. Readers want to know if it’s tacky to use Cuba as a theme. We’ve been working on a “Havana Nights” theme for our school’s gala. With Castro’s death, we are a little worried that things could happen in Cuba that make this theme too political. We’ve also heard from a parent who believes the theme is offensive due to the politics in Cuba. Any ideas for a gala theme that would incorporate the whole Cuban vibe without actually calling it Havana Nights? Thanks for any info!! How about “Little Havana,” focusing on a Cuban area of Miami. It’s all the Cuba you want, based in the USA. What observations have you made from your client meetings and auction experience? 1. Trips to Cuba are popular auction items. Trips to Cuba have been popular sellers in my auctions over the past two years. If you study my Auction Item Guide™, you’ve probably picked up on this. 2. Cuba’s human rights violations may or may not matter to your group. Of all the times I’ve been in conversations with my clients about Cuba, in only one instance did a group (a Catholic school) find the idea of selling a trip to Cuba as inappropriate. They opted to sell a trip to Ireland instead. A social services client is run by an Executive Director who *is* Cuban. She visits relatives in Havana regularly. In our meetings she said (to paraphrase), “I bet it is a popular trip. I can see as why Americans would like it.” She was right. Not only did the trip generate a strong buzz before the auction, but it became the highest selling item at their gala. In short, you’ll never please everyone. You might get push back from one person or a crowd of people. Use your judgment to figure out if you should abandon your ideas or move forward. 3. Cuba is newsworthy. It can score you some press. Cuba is so trendy that a trip sold in one of my Chicagoland auctions last month caught the eye of a journalist. In the first sentence of her story, the reporter acknowledged her surprise at even noticing the nonprofit’s email: “I don’t normally pay that much attention to auctions of local fundraisers, ” she wrote, “but this one caught my eye for its news value alone.” Cuba was one of the items that grabbed her. 4. Cuba is becoming more popular for school class / field trips. More than one school auction client has told me that at least one of their student class trips is visiting Cuba next year. Not all schools have class trips for their students. But for those that do, Cuba has become a more popular destination. School trips like these dictate that families discuss the location at home (E.G. “Should we send Johnny on the class trip this year?”). The trip raises awareness about a country. If your school has had or will soon have a trip to Cuba, expect your audience to be more astute about the country. 5. Cuba is popular as a gala auction theme — and always has been. “Havana Nights” themes have been steadily popular since I opened my business in 2005. Maybe I’ve witnessed a slight uptick in the popularity of the theme in the last three years, but the concept itself I’ve seen for many years. 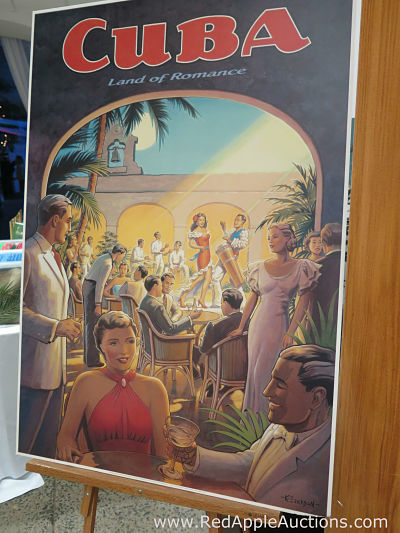 Often the theme takes a romantic look at Cuba during it’s heyday, showing vintage posters from decades ago. The lead photo in this article is one such example. What does the future hold for Cuba and fundraising auctions? With an unpredictable administration entering the White House, what’s going to happen with Cuba? More specifically, what’s going to become of the nascent US-Cuba relationship. Will trips continue? Will the USA kill diplomatic relations? What will happen with our auctions? Personally, I’m planning to visit Cuba in 2017. How are groups showcasing a Cuban theme? Below is a video from a March 2015 school auction. Over 400 guests attended. The school beautifully transforms its two gymnasiums into an elegant Havana Nights vibe. Below is a video from a March 2016 school auction. About 150 guests attended this event, which was held in the atrium of a botanical garden. Below is a video from a May 2017 nonprofit auction for CASA. Unlike the two events featured above, the CASA event was a Fund-a-Need-only fundraiser. There was no live auction or silent auction as part of the evening. There were 210 guests attending the function, which was held in an old armory. Is your fundraising auction ready for a sultry Cuban theme? It’s a personal choice as to whether you adopt a Havana theme, sell a Cuban trip, or incorporate this culturally rich country into your event in some other way. There is no right answer for everyone. But still, I’d love to know what YOU think!